You've tested our space expert and he's got the knowledge! Over the last few weeks people have been sending their questions in to the Cosmic Comics astronomy expert. From black holes to green stars, colliding galaxies to space photography - nothing is beyond Professor Paul Roche! What is the smallest star that we know about? What is the biggest star that we know about? 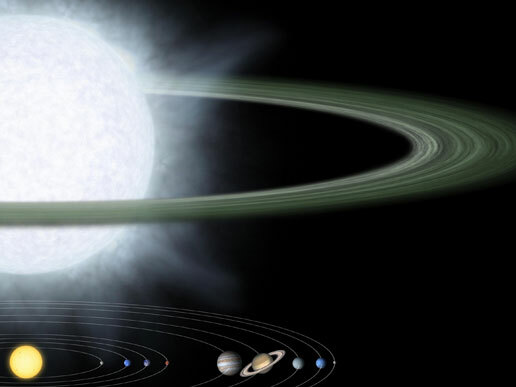 Why do stars twinkle but planets don't? Will there be a time when new stars stop forming? Are there any green stars? 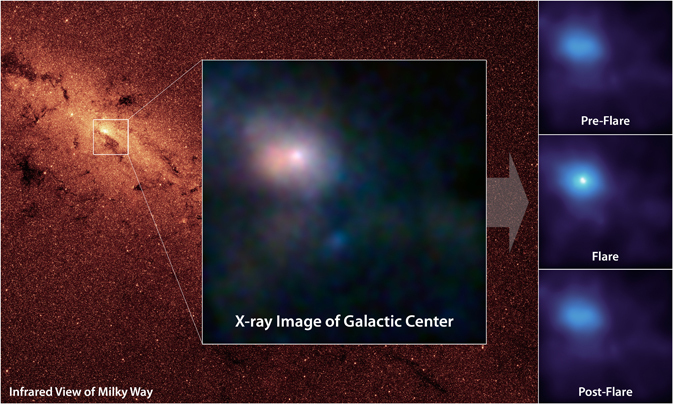 What created the black hole in the centre of our galaxy? Has the Great Andromeda Galaxy ever collided with any galaxies? Can you see out of our galaxy from Earth? What is the difference between the Kuiper Belt and the Oort Cloud? How far into the past will you see with the James Webb telescope? Do you need a special camera in space? Which are the most likely places in our solar system for life to exist (aside from Earth of course)? If a black hole and a white hole ever collided, what would happen? A grey hole? Why do people think that lifeforms on other planets are going to be green mutant aliens or some great monster? What if they were just like ourselves - humans? A1. What is the smallest star we know about? There is actually a lower limit to how "low mass" an object can be before it stops being a star, and that is around 7-8% of the mass of our Sun. Below that, the object does not have a high enough core temperature and pressure to join hydrogen atoms to make helium (this "fusion" is what heats the star). 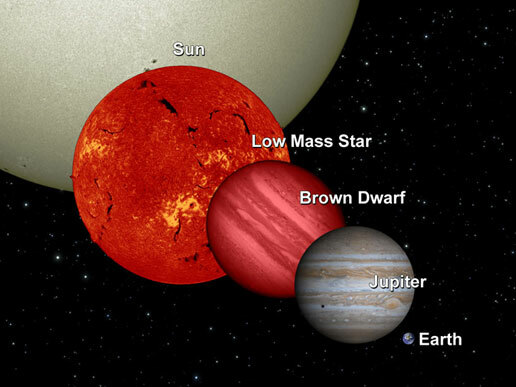 We would call one of these objects a "brown dwarf", and even the most massive brown dwarfs might only be slightly bigger than our planet Jupiter in physical size. One of the smallest dwarf stars discovered so far is AB Pictoris b which about 147 million light years away and is twinned with a K-type star that is slightly cooler than our sun. So the smallest (in terms of mass and radius) 'normal' stars are not that much bigger than gas giant planets. But if we include dead stars into this question, then a white dwarf star (the sort of thing that the Sun will eventually evolve into) might only be the size of the Earth (10-15,000 km in diameter), whilst a neutron star would be more like 20km in diameter - and yet could still contain twice the mass of the Sun! A2. What is the biggest star we know about? The biggest stars we observe are called "hypergiants", and if you placed them where the Sun is, their outer surfaces would lie somewhere between the orbits of Jupiter and Saturn in our Solar system - so they really are extraordinarily big! It's very difficult to accurately measure the size of a star, but there are several candidates for being the "biggest". These include the "Pistol Star" and VW Canis Majoris - but currently the biggest star observed is called V1489 Cygni, and it is thought to be almost 1,650 times the diameter of the Sun. This is a red hypergiant, and the red colour tells us that the surface temperature of this enormous star is much cooler that our Sun - maybe only 2, 500 degrees Celsius. A3. Why do stars twinkle but planets don't? The twinkling (or "scintillation") that we see is a result of light having to pass through Earth's turbulent atmosphere. Our atmosphere has several layers, each with a slightly different density and temperature. so that light passing downwards will be bent ("refracted") by small, random amounts many times before reaching an observer. Stars (except for the Sun) are extremely distant, and just appear as dots (what we call "point sources") of light. Planets are much closer, and cover a measurable area of sky - we say they have a "disc". The effects of the atmosphere on a point source are far more noticeable than those on a planetary disc, where the twinkling effects are smoothed out over a larger area. The light from the point source appears to change in position and brightness - it twinkles. The size of a planet on the sky essentially "averages out" atmospheric effects, leaving a relatively stable, untwinkling image. Stars close to the horizon twinkle more than stars overhead because the light from stars lower in the sky travels through more air and so suffers more refraction. A4. Will there be a time when new stars will stop forming? 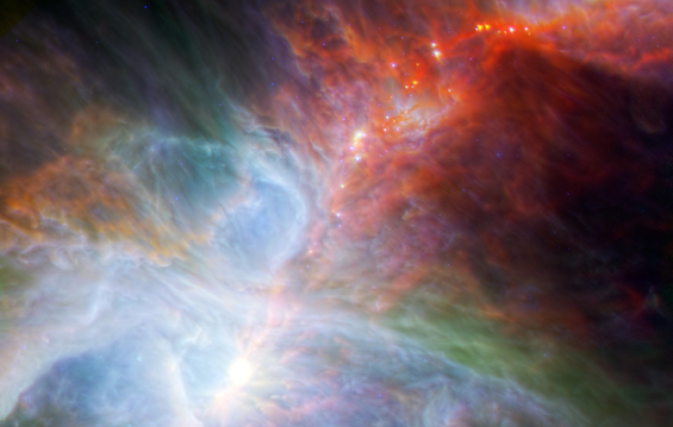 New stars form in nebulae (clouds of gas and dust) and they need hydrogen to begin the nuclear fusion process. This process, joining hydrogen atoms together to form helium, powers the stars during the Main Sequence where they spend most of their lifetimes. Hydrogen is the most common element (around 90% of the universe's atoms are hydrogen). However, in order for stars to form, there must be enough hydrogen present in an interstellar cloud fragment for nuclear fusion to start - too little mass and you end up with a brown dwarf, sometimes called a "failed star". So - not enough hydrogen for fusion to start = no more stars! There will come a time when there is not enough hydrogen around for these collapsing clouds of gas to get fusion going, but this will be a long time into the future. A5. Are there any green stars? You would think that in a place as enormous and amazing as the universe that you would be able to find absolutely anything, right? In fact - the temperature that you need to get green light is about 10,000 degrees Celsius. There are lots of stars in that temperature range, including ones that can be seen from Earth like Vega and Sirius (the brightest start in the night sky). So why aren't they green? Well, actually, they do emit green light! The problem is that green is right in the middle of the visible light spectrum. A star as hot as 10,000°C on its suface will be emitting lots of red and blue light as well, so the whole thing blurs to white. For a star to look green to us it would have to emit only green light, and that's impossible for a gigantic ball of burning gas! Contrast is important too... An isolated "green" star would appear white, but place it next to a red star and you would see a greenish tinge, as the eye tries to make the "average" colour white. B1. What created the black hole in the centre of our galaxy? The answer is that we don't really know - it's almost a "chicken and egg" situation. Which came first, the black hole (and the galaxy forms around it) or the galaxy (and the black hole forms within it)? Most galaxies seem to have massive or supermassive (billions of times more massive than our Sun) black holes at their centre, and it is still a big question in cosmology as to where they came from initially. What we do know is that, however they formed, they are slowly growing through the consumption of gas, dust and occasionally whole stars (which are torn to shreds by the intense gravity near the edge of a black hole, forming a huge "accretion disc"). So whilst we don't quite understand what first causes the black hole to form, we can monitor how these systems behave, and in particular we can observe what happens when they "over eat" - enormous outbursts of radiation giving rise to objects such as quasars that we can observe at huge distances across the Universe. Yes, everything we see in space is moving. When we look out at distant galaxies, they are all rushing away from us, and the further away they are, the faster they are moving - this is some of the evidence that makes us think everything started in a Big Bang. But if we were on another one of those galaxies, it would still look like all the other galaxies were rushing away from us - it is not just that the galaxies are moving, but also the space in between galaxies is expanding as well. You can imagine this effect if you think about gluing sweets (which represent galaxies) on to a rubber sheet (which represents space). If you stretch the rubber sheet (expanding space), the sweets (galaxies) all move away from each other - but every sweet (galaxy) would see the others moving away from it, so none of them are "special", it is just what they see from their place in space. B3. Has the Great Andromeda Galaxy ever collided with any galaxies? 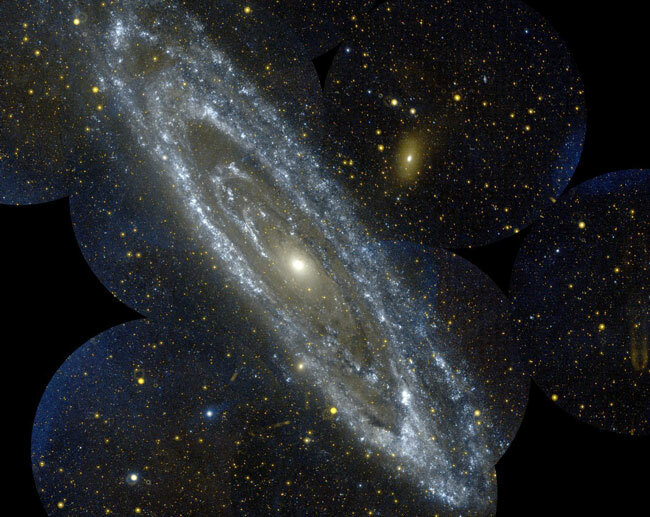 The Great Andromeda Galaxy (M31/NGC224) will collide with our Milky Way galaxy in about 4 billion years, but in the past it must have collided with small galaxies, just as our own galaxy has. In fact, our Milky Way is still in the process of "consuming" two smaller galaxies, which we call the Small and Large Magellanic Clouds - these can be seen from southern hemisphere skies (see below). Astronomers think that galaxies grow by gradually consuming their smaller neighbours in a process we call a "merger" (or sometimes more descriptively "galaxy cannibalism"!). To become as large as it is (almost 2-3 times the size of the Milky Way), Andromeda must have consumed many smaller galaxies. However we can't easily see much evidence for those past mergers today. Observations suggest that Andromeda originally formed from a merger about 8-9 billion years ago, and since then it has had close encounters (but not collisions) with the neighbouring (smaller) galaxies M33 (2-4 billion years ago), M32 and M110. A large group of stars within the galaxy called the "Andromeda Giant Stellar Stream" might be evidence of a past merger, and there appears to have been a lot of new stars born about 100 million years ago, which is also a good indication that a merger took place then. After Andromeda and the Milky Way collide, the result will probably be a giant elliptical galaxy. B4. Can you see out of our galaxy from Earth? Yes, we can see many, many other galaxies beyond the Milky Way (which is what we call our home galaxy). Using large telescopes, we can see for huge distances, and that means we can see beyond the Milky Way. We can see some nearby galaxies, like the Large Magellanic Cloud and the Small Magellanic Cloud, which are our closest neighbours - we are all part of a group of about 54 galaxies called the "Local Group". But telescopes can see much farther than this, and in the future we will have bigger, better telescopes that will allow us to see the very first "baby galaxies" that were born a few hundred million years after the Big Bang. B5. What happens when two galaxies collide? 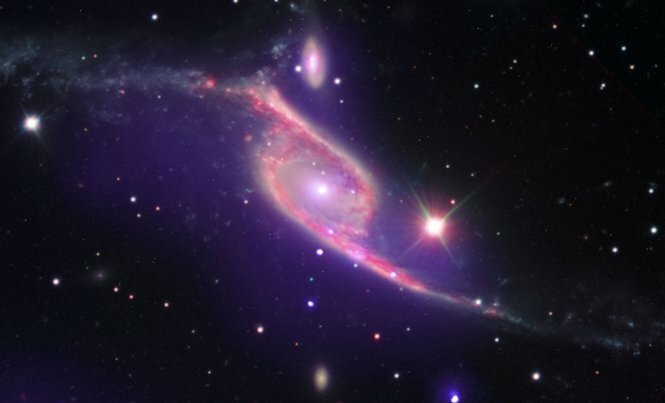 You might think that two galaxies colliding head-on would be an incredibly destructive event. Imaging billions of stars rushing towards each other, ready to crash, smash and bash! But remember, the spaces between stars in galaxies are massive! The nearest star to our sun is Proxima Centauri which is over 4.2421 light years away - that's 24 trillion miles! Think about those truly mind-boggling gaps and you start to see that stellar collisions will actually be rare events. In fact, galaxy "interactions" usually lead to huge amounts of star creation, rather than destruction. Stars themselves are tiny compared to the spaces between them, but the gravitational forces involved are truly vast. When stars and galaxies come together, gravitational shock waves result in massive increases in density in interstellar gas clouds. It's inside these gas clouds that stars are born, so these events trigger intense bursts of star formation (so-called "starburst galaxies"). Interacting galaxies often display tidal tails - streamers of stars, gas and dust dragged free of the parent galaxy. As well as the immense spaces, the timescales for collisions are huge (hundreds of millions or billions of years), so we only ever see a snapshot of the interaction, but many such interacting galaxies are observed. The Cartwheel Galaxy is a particularly spectacular example of a nearly centre-to-centre collision, resulting in the nucleus being stretched open like an expanding ring. C1. What's the difference between the Kuiper Belt and the Oort Cloud? The Kuiper Belt is a flat disc of comets orbiting the sun that have "fallen in" from the more distant Oort Cloud. The disc is out beyond Neptune which means that they take a few hundred years to complete and orbit. We think there are some larger objects out in that region too, like the dwarf planet Pluto - we call these Kuiper Belt Objects (not a very imaginative name!). These objects orbit around in roughly the same flat disc that the planets and asteroids do, around the equator of the Sun. The Oort Cloud is not a flattened disc like the Kuiper Belt, but instead it is a huge sphere (or cloud) of maybe a trillion (a thousand billion) comets that surrounds the entire solar system. This is the edge of our solar system, and it might even overlap with a similar cloud that we assume surrounds the nearest stars to us - so we might even be swapping comets with nearby stars! Interestingly, no-one has ever seen the Oort Cloud - the comets are too far away, and much too faint, to be seen - we believe it is there because of the paths of some "long period" comets, that seem to fall in towards the Sun from all sorts of directions. The Kuiper Belt comets would approach the Sun from directions roughly lined up with it's equator, as that is where they orbit, so the fact that we see some comets coming from above and below the poles of the Sun suggests they must be orbiting around in directions very different from the rest of the solar system objects we see. C2. What are comets made of? Comets are often described as "dirty snowballs", but we now think they might be more like "snowy dirtballs" - the solid bit of a comet, called the nucleus, is made of water ice mixed with "dry ice" (solid carbon dioxide), and seems to be coated with a very black material that is rich in carbon. The ice is very dirty, with lots of rocky material mixed into it, which is where we get the "snowy dirtball" name! D1. 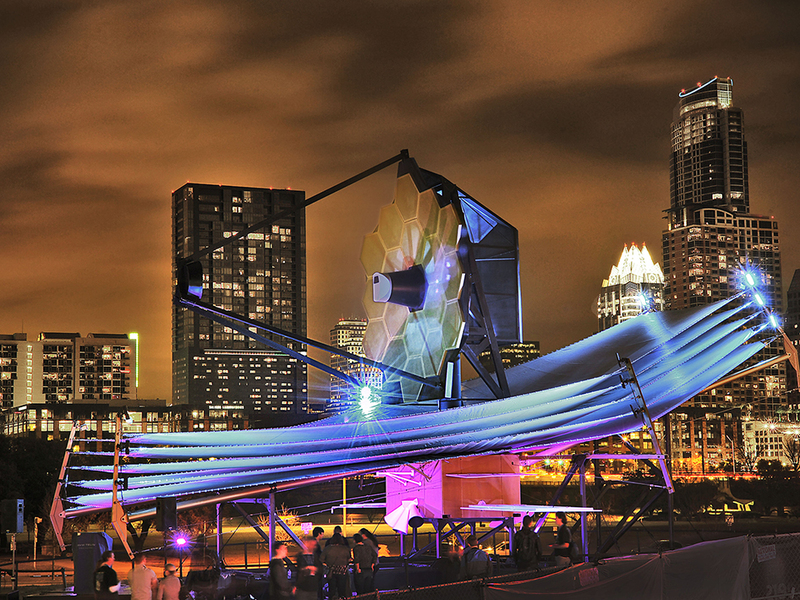 How far into the past will you see with the James Webb telescope? As we look out into space, we look back in time, because the light we are now seeing has been travelling for a long time through the Universe. The James Webb Space Telescope will be the largest space telescope to ever be built and launches in 2018. Using it's array of instruments it will be able to see infrared light which was emitted by galaxies about 300 hundred million years after the Universe was created in the Big Bang (which scientists think was 13.8 billion years ago). D2. How fast is the universe expanding? When we look at distant galaxies, we see that they all seem to be rushing away from us - and the further away they are, the faster they are moving. So we can't say exactly how fast any particular galaxy is going to be moving, we just have to measure each one separately. This was first noticed by the astronomer Edwin Hubble (after whom the Hubble Space Telescope is named) in 1929. We can estimate roughly how fast a galaxy should be moving, using something called "Hubble's Law" - this is an equation that allows scientists to estimate just how fast a galaxy should be moving, if we know how far away it is. To do this, we need to know a number called the "Hubble Constant", and for a long time this was very hard to measure - but now we think we know the value of this number quite accurately, so we are more confident that we can estimate how fast the universe is expanding. Note: The value of the Hubble Constant was very recently determined (21st March, by measurements from the Planck satellite) to be 67 kilometres per second per Megaparsec - that means that for every 1 million parsecs away a galaxy is, the speed will increase by 67 kilometres per second. A million parsecs is about 3,260 million light years. Using this value for the Hubble Constant, the age of the universe is now thought to be 13.81 billion years (plus or minus 0.05 billion years). D3. Do you need a special camera once you are in space? The cameras that are used in space are specially designed to survive in the difficult conditions they will have to work in. When the camera is in darkness, it will be extremely cold, but when it is in sunlight, it will be very hot - a normal camera would not be able to survive this freezing and roasting, so the cameras used on spacecraft are protected to allow them to work in space. We also have special cameras that allow us to see different types of light that are not usually seen from the surface of the Earth (because the atmosphere does not let them through), such as infrared and ultraviolet light from stars and galaxies. D4. Which are the most likely places in our solar system for life to exist (aside from Earth of course)? The search for places where life might exist is usually driven by the search for liquid water - on Earth, where there's life, there's water. So we need to look at places that might still have liquid water, and outside of the Earth there are not too many of those. Many scientists think that life might once have existed on Mars, when it was warmer and wetter than it is today - if it did, it would very simple life-forms, like microbes, not the sort of aliens you see in films! There are some parts of Mars today where life might still exist, below the surface and sheltered from the intense cold and the radiation that the surface is exposed to - but we need to send scientists who can drill deep below the ground before we can really study that in detail. Some other places where we might look would be beneath the icy surfaces of some of the moons of Jupiter and Saturn. Jupiter has a moon called Europa that we think has a liquid water ocean hidden beneath a crust of ice that might only be a few hundred metres think in some places - and that ocean could be 200km deep. D5. If a black hole and a white hole ever collided, what would happen? A grey hole? There really isn't any research on this topic, and the biggest problem is that the concept of a "white hole" is theoretical - a mathematical trick which couldn't exist in the universe without breaking the laws of physics as we understand them. In the end though, the idea of a white hole comes out of certain mathematical equations. Black holes on the other hand have been observed and studied for several decades now, so we are confident that they exist (or at least, as confident as we can be without actually seeing one!). An entirely made-up picture of a black and white hole. So, if a white hole did exist, and collided with a black hole - what would happen? As you might be able to guess, there really isn't an answer to this one (or if there is somewhere in the world of theoretical physics we probably wouldn't be able to work out what the sums meant). A question we can answer is what might happen if two black holes collided. In theory an enormous amount of energy would be released. In fact, we think that we might actually see this happen as events called Gamma-ray Bursts. These GRBs have been observed for over 40 years, sowe think we have good evidence that two black holes can collide and create a bigger black hole. These events will be extremely rare (because getting two black holes close together will be very rare) but the universe is very big, so we see a few events that might be black hole-black hole collisions every year. D6. Why do people think that lifeforms on other planets are going to be green mutant aliens or some great big monster? What if they were just like ourselves....humans? For most people, the view of what alien life might look like is mainly from television and movies and so is more often the ideas of an author or a special effects person rather than a scientist. As many TV shows and films show aliens as aggressive invaders, we might be forgiven for thinking that this is how science thinks alien life will be. However, many scientists believe that the most likely "aliens" that we will discover will actually be very simple lifeforms, like bacteria. In particular, there are things called "extremophiles" that have been found to live in extreme environments on Earth, like inside volcanoes, poisonous lakes or in the depths of the oceans - lifeforms like these, which can survive in places that would kill a human (too hot or too cold; full of toxic chemicals; massively high or low pressures etc. ), would be able to survive on places like Mars (which has no air, is freezing cold and has almost no atmospheric pressure). The chances of life just like us (i.e. humans) existing out there would probably be extremely small, as we have evolved to fit in with our particular environment over billions of years. Many science fiction shows have aliens with the same basic physical set-up as us: 2 arms, legs, eyes, etc. This is probably because it is easy to do this for the make-up and special effects people, rather than because we think our body shape is likely to be very common in the universe!